Why isn’t Nicaragua part of the Paris Agreement? 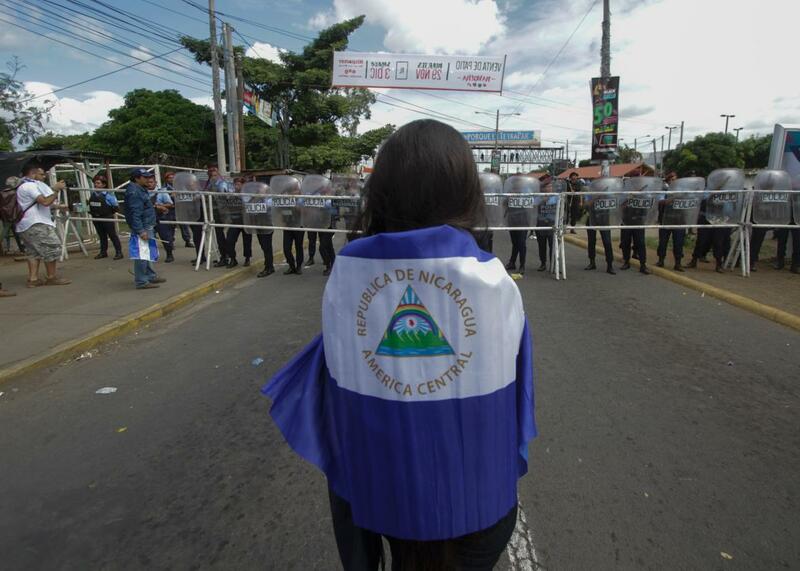 A protestor marches against the creation of the Nicaragua Canal. On Thursday, President Trump announced that the U.S. will withdraw from the Paris Agreement on climate change. The U.S. will join just two other U.N. member countries that haven’t signed on: Syria and Nicaragua. It would seem pretty clear why Syria hasn’t signed on to the agreement, given the current political turmoil, but why is Nicaragua so against it? Because the agreement doesn’t do enough to fight climate change. Nicaragua’s Paul Oquist, who represented the country at the Paris negotiations in 2015, has said that Nicaragua’s main problem with the Paris Agreement is that countries’ pledges to fight climate change—known as “intended national determined contributions”—are voluntary. Oquist says that because the commitments aren’t binding, the climate change agreement will fail to meet its goal. “[We’re not going to submit because] voluntary responsibility is a path to failure,” Quist said in 2015 to a reporter from Climate Home. “We don’t want to be [an] accomplice to taking the world to 3 to 4 degrees and the death and destruction that represents.” The Paris Agreement calls to limit climate change to “well below 2 °C above pre-industrial levels,” though there is disagreement about how useful that goal is. Oquist also argued that the responsibility for fighting climate change needs to fall on the countries that emit the most greenhouse gases, not the smaller countries that barely emit any by comparison. As you might expect, Nicaragua has far less of an impact on the state of climate change compared to the United States. While the U.S. ranks second in the world for carbon-dioxide emissions (behind China), Nicaragua ranks 131st, according to the U.S. Department of Energy. Oquist seems to see himself, and Nicaragua, as taking a stand for many other countries. “A lot of developing countries have conditioned their [intended national determined contributions] on receiving finance and that finance is nowhere to be seen,” he said in 2015. Nicaragua has been part of international agreements on climate change in the past. The country signed on to the Kyoto Protocol in 1998 and ratified it a year later. Unlike the Paris Agreement, the Kyoto Protocol included real consequences for Annex 1-level countries, like Australia and members of the EU, if they failed to meet the standards they had agreed to. It is that sort of binding commitment that Nicaragua presumably wanted from the 2015 accord. The Paris Agreement’s “intended national determined contributions” didn’t start out as voluntary. Back in 2009, at a major climate change conference in Copenhagen, a proposal that included binding commitments was in fact proposed, but the United States did not sign on. Nicaragua has also made leaps and bounds in the past decade in terms of renewable energy. Two years ago, NPR reported on Nicaragua’s shift away from foreign oil and toward thermal and wind energy, something they can do thanks to their 19 volcanoes and excessive, powerful winds. In fact, according to the World Bank, Nicaragua is on the path toward having 90 percent clean renewable energy by 2020. But its environmental record isn’t completely pristine. Nicaragua has taken a lot of heat from environmental groups over a planned canal—similar to the famous one in Panama—to be built by a Chinese company, which will retain the rights to operate it for the next 116 years. Construction on the project is supposed to begin this year, but since its inception, it’s has faced multiple delays. The International Federation for Human Rights has come out with a statement saying that the building of this canal will be bad for both the environment and Nicaragua’s citizens. According to the IFHR’s website, plans call for the canal to cut through the main fresh water reserve for Central America, Lake Nicaragua, which provides water for 80,000 people and a home for 40 species of fish. This canal is expected to pollute the lake it runs through and displace a minimum of 30,000 people. The executive secretary of the Nicaraguan commission overseeing the canal? Oquist, the country’s chief climate negotiator.